How does the melt discharge pump work normally? How does the melt pump usually work? I believe that the first time to buy a melt pump will be more curious, then with the Haike Xiaobian to learn about the structure of the melt pump and how it works? The melt pump is made up of pump housing, front and rear side cover, gear shaft, sliding bearing and shaft seal. 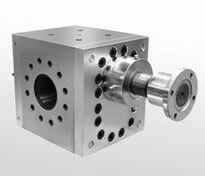 Melt gear pump belongs to positive displacement pump. When it works, it relies on the change of working volume caused by the intermeshing of the main and driven gears to transport the melt. The working volume is composed of the pump body, the cogging of the gear and the bearing with the side plate function. When the gear rotates, the melt enters the grooves of the two gears in the suction cavity. As the gear rotates, the melt is brought into the discharge cavity from both sides, and the gear meshes again, so that the melt in the groove is squeezed out of the discharge cavity and pressed into the outlet pipe. As long as the pump shaft rotates, the gears push the melt to the outlet side, so the pump outlet can reach a high pressure, and the flow rate has little to do with the discharge pressure. High viscosity melt discharge pump gears are often straight teeth, helical teeth, herringbone teeth, spiral teeth, tooth profiles are mainly involute and arc type. Usually small gear pumps use involute spur gears, high-temperature gear pumps often use modified gears, high viscosity, high-pressure polymer melt transport pump using involute helical gears. The gear is integrated with the shaft, and its rigidity and reliability are higher than that of gear pumps made separately by gear and shaft. The gear of low pressure gear pump abroad often adopts a square structure, that is, the width of the gear is equal to the diameter of the addendum circle. The tooth width of high viscosity gear pump used in high pressure occasion is smaller than the tooth top circle diameter. This is to reduce the radial pressure area of the gear and reduce the load of the gear and bearing. How much can the extruder and melt pump increase?